There are times when i have little patience to cook a dish that takes a long time. That's when i look for easy to cook, healthy and filling meals. Today i just opened my cupboard and found a packet of tortellini. That's when i decided of making a quick tortellini salad. Being a tortellini fan i would use it here and there every now and then. I would also like to share my experience from the time i included salad in my daily diet, i have been benefited a lot health wise . Here's sharing you the healthy recipe, Hope you like it. Carrot- 4 , large in size , Washed peeled and chopped. Tomato- 4, Medium in size, cut into cubes. Lettuce leaves- Washed , Dried with kitchen towel, and gently tore with hand into small chunks. Corn - 1/2 cup boiled and salted. Boil 1 liters of water, by adding salt to it. Once the water gets boiled, add the tortellini to it and cook it for 8 minutes. After 8 minutes turn off the heat and drain the water. Transfer the tortellini in a large bowl. Add 1 tbsp of butter to it and simply toss it. In the same bowl bring together all the other ingredients, mix well by adding lime juice and olive oil. 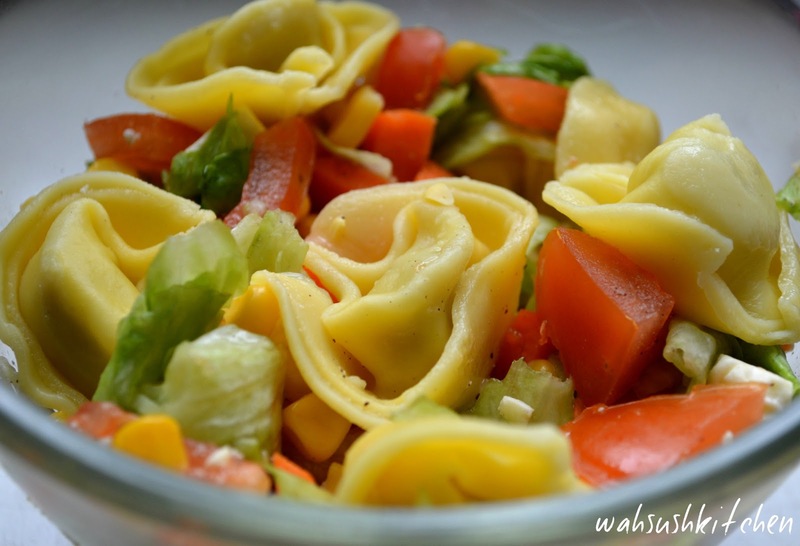 Your quick and healthy tortellini salad is now ready to be served. if you want to eat them cold you can cover it and refrigerate it . This way tortellini absorbs all the flavors of lime and pepper and make our salad more mouth watering. I love this pasta . very tasty and nice flavors . Sahi kaha aapne, anek prakar k pasta bajaron mein uplabdh hain, aur inke banane ki vidi kariban ek saman hi hai. Europe me khaskar italy mein 50 se bhi adhik prakar k pasta ka utpadan hota hai. Inme se kuch pasta jaise ki tortellini me cheese aur palak ka mishran bhara hua paya jata hai, jo ki khane me aati swadist hota hai. Aapke Comment k liye Dhanyawad.